British bargain hunters have shunned high streets and shopping centres this Boxing Day, according to early indications that highlight the growing competition faced by traditional retailers from online stores. Retailers sought to put a positive spin on trade on one of their most crucial days of the year, but early estimates of Boxing Day footfall, a measure of shopper numbers, showed it was down 7.2% on a year ago by 4pm. The decline was driven by a 15.5% drop in shopping centre footfall and 4.7% decline in those visiting Britain’s high streets, according to the figures from retail analysts Springboard. Out-of-town stores did not fare quite so badly, with their footfall down just 3% on Boxing Day 2015. Diane Wehrle, Springboard’s insights director, estimated that once figures for the full 24 hours were in they would show a Boxing Day drop of about 5% on a year ago. 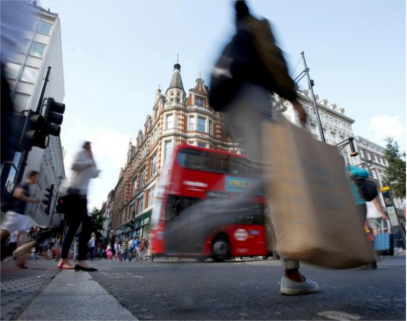 The decline in footfall follows signs of slowdown in retail sales amid rising consumer worries about inflation and the uncertain economic outlook after the Brexit vote. Stores traditionally targeted by Boxing Day bargain hunters continued to report strong trade and there were signs the weak pound was helping to bolster takings from tourists. In London, Harrods said it was expecting a busy Boxing Day to build on a strong run-up to Christmas when it had achieved double-digit sales growth on a year ago. The managing director of the luxury department store, Michael Ward, said butlers were on hand on Monday to serve queues of shoppers coffee and croissants. “I have to say we have never seen numbers like it, 20 minutes after we opened they were still streaming in from Sloane Street,” said Ward. “Christmas has been particularly strong this year,” he said, highlighting solid demand for bags, shoes and diamonds, with Yves Saint Laurent and Gucci among the most popular brands. Ward said Harrods had been insulated from the economic gloom emerging in the UK since the Brexit vote. “The top end of the market is always less affected than anyone else. The second [factor] is to an extent London is a bit of a bubble in the UK. So from our perspective we’ve got great local customers plus we’ve seen more international customers come to London,” he said. Harrods, like other UK retailers, has benefited from tourist spending since the pound’s sharp fall against other currencies after the EU referendum in June. The pound’s weakness has meant tourists’ spending money here stretches further and official figures show a jump in watch and jewellery sales after the Brexit vote. Ward said the weak pound was only part of the picture in the pickup in spending at Harrods by visitors from China, Thailand, Malaysia, the US and the Middle East. “To some extent, it’s the pound being weaker but also London is seen as a much safer place to come and shop. So the atrocities in France and in Germany have meant that people will centre on London as a destination that they feel safer in,” he said. In Sheffield, the Meadowhall centre was expecting its busiest day of the year with 160,000 shoppers on Boxing Day. Its director, Darren Pearce, said shoppers had queued from 2am, six hours before opening time. Despite some surveys showing a dip in consumer confidence and rising worries about inflation, Pearce said the centre had been busy this Christmas. “The week leading up to Christmas was our busiest of the year, with bestselling toys including Nerf Guns, Hatchimals and Lego Star Wars, according to our retailers. The parka jacket for men, women and kids has also been a top seller,” he said. Selfridges also sought to send an upbeat message about Boxing Day trade and said customers were queuing from the early hours for sale items. It took £2m in the first hour of trade across its four stores and online. Intu, the owner, manager and developer of regional shopping centres at sites including Braehead, Gateshead and Milton Keynes, also said it was expecting heavy footfall.